Traditional RPGs are games of the mind, but it doesn’t hurt to have spiffy little plastic figures on hand to help set the tone and sort through the complexities of battle. Figures can be bought unpainted or, for a bit more cash, they come prepainted. As a busy parent, I easily fall into the latter category. While any figurines aren’t cheap, they can add a bit of fun as players can see the unruly monsters gather around their poor characters, eager for a kill. The popular Pathfinder RPG (put out by Paizo Publishing) remains one of the most popular RPGs around. 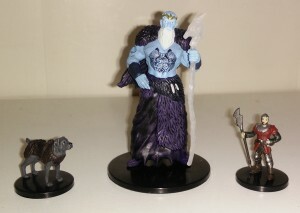 In addition to regular books, supplements, and adventures, Paizo also licenses a line of figurines produced by Wizkids (makers of the Heroclicx figurine game.) The newest entry in this line of pre-painted miniatures is The Rusty Dragon Inn, featuring many examples of everyday folks one might find in a tavern or town. 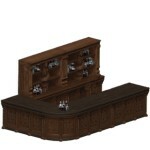 The figurines come in a box of three medium sized figures and one large figurine. Within the two sizes the figures also have a bit of rarity. You’ll see more town guards, for example, than captains of the town guard. This is both good and bad. One might want to have one of every figure, but it also makes sense that you might want more town guards than guard captains. The barrel is a “rare” figure for some reason, although I could see how you might only need so many barrels. In addition to folks in a town or tavern, there are still plenty of fun “monster” pieces in the set. Some of my favorites were the “riding dog” for little people and a large Storm Giant (a town guard thrown into the photo for scale. The painting on the minis isn’t something that will make it into a museum, but it is probably better than could do and certainly better than what I might have time to do. I’m definitely not going to paint those tattoos on the giant. I have a fair number of figurines I’ve accumulated over the years, painted and some unpainted (almost all of those are still unpainted.) What I like best about this release of figures are that they are simple, everyday figures that one might use anytime players venture into a town. Sure, I have a figure or two that could stand in for a farmer or bartender, but nothing that really looks the part. I have a pile of zombies, but until this release I didn’t have a plain old horse. To cap things off, I now even have a horse-drawn wagon! 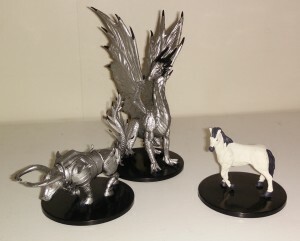 A couple of the flashiest pieces I received were two silver painted pieces, a silver dragon and a mechanical bull (Gorgon.) I also like the second horse, listed as a warhorse. For most, this is all going to come down to money, and money is the weakest aspect of the figurines. 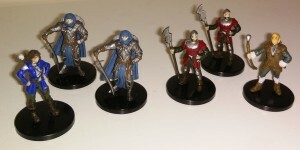 A package of four figures (3 small, 1 large) sells for $11-$15 retail, more than $3 each. That is a pretty hefty price tag in general, but isn’t so bad for the world of miniatures (unpainted ones can cost $2-$5.) You can buy a 6 inch Iron Man action figure for $12, so $11 for four smaller (and better painted) figures doesn’t sound so bad. Made of flexible plastic, these figures can take a bit of pounding. Don’t let your youngest eat them, and keep the older kids from losing them or checking their tensile strength. I haven’t had problems yet, and the paint on these things tends to do OK over time, although if you put everything in one big box and shake it around all the time you might get a few chips. If you treat them with even a small amount of care they will hold up just fine.